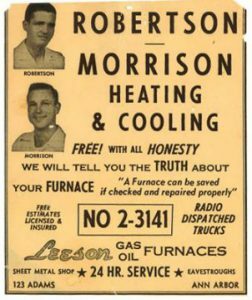 For more than 50 years, Robertson Morrison has been providing unmatched heating, cooling and sheet metal services in Ann Arbor and the surrounding areas. Founded in 1961 by Paul Robertson and Harry Morrison, Robertson Morrison, Inc. was built on a foundation of relationships and a steadfast commitment to quality. Prior to starting the company, Paul Robertson worked for Montgomery Wards in the plumbing and heating department as a furnace salesman. Wanting to do more than sales, Paul purchased one of Montgomery Ward’s furnace installation companies and proceeded to open Robertson Heating out of his garage in 1959. 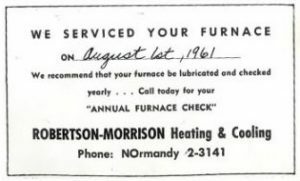 At this time, Harry Morrison was the founder and sole employee at Morrison Heating. 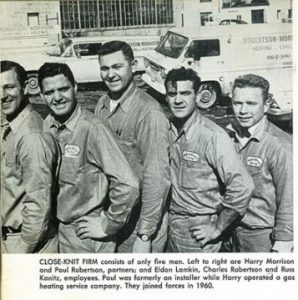 Paul crossed paths with Harry during a service call to his own house and shortly after contracted Harry for gas furnace service at Robertson Heating. In 1961, Paul and Harry combined businesses to form Robertson Morrison, Inc. The company initially focused on residential work, but due to their early success, opened their commercial HVAC division in 1962. Current owner, Frank Johnson, joined the company as an estimator while attending the University of Michigan School of Architecture. In 1982, Frank purchased the company and has since grown the once eight-employee company into a multi-division operation focusing on commercial projects and custom residential homes in Southeast Michigan.